How to Make Extra Room in Your Suitcase - Hej Doll | Simple modern living by Jessica Doll. Pictured: Tumi Tegra-Lite International Carry-On, Marysia Mott Swimsuit, J.Crew Gladiator Sandals (similar by Steve Madden). Up until now all of my packing lists and travel tips have been about packing to leave on a trip, but what about packing to come home? We’ve all been there, you go on an amazing trip and do some shopping, then are not sure how to fit all of it back into your suitcase to come home. It seems to happen during every trip for me, but during our last trip in Iceland I was dying to bring home an Icelandic wool blanket and a few other goodies, but there wasn’t much extra space in my suitcase. 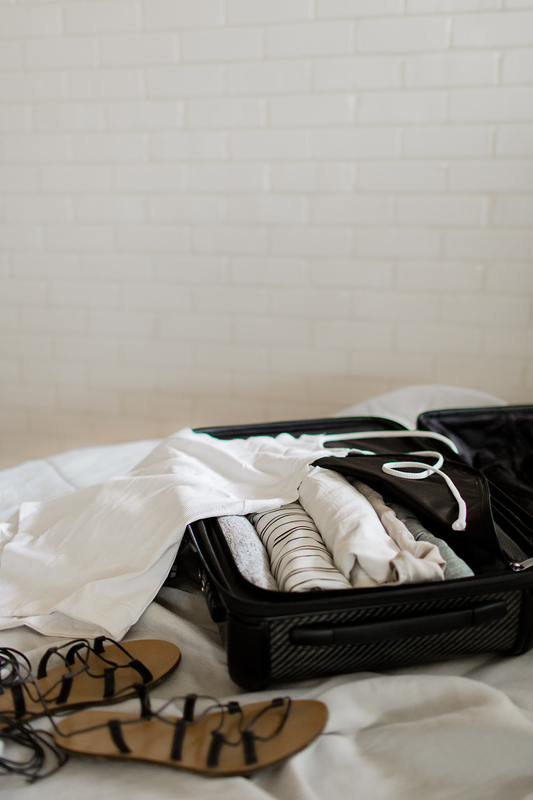 After getting creative with my packing I was able to make it all work, so today I’m sharing with you my best tips for how to make extra room in your suitcase. I like to separate my items first so I can get a good visual of everything I need to pack. I make a pile of dirty clothes, clean clothes, shoes, liquids, personal item only items such as a laptop and camera, etc. During our family trips I have all of our stuff to deal with, so it is a bigger job to re-pack everything for the trip home, but I simply treat it as one instead of going suitcase by suitcase. This will make sense in the next tip. Where are these items going? If you’re alone and didn’t check a bag you’ve likely got a carry-on suitcase and a personal item to fill. Think about how logically the items might fit inside best, and what kind of extra space you are looking to get. I typically add shoes, dirty clothes, clean clothes, and then have extra space on top for souvenirs. The items that take up the most space in your suitcase should go in first, then later you can add others around them. Items that fit into this category can also be specialty items such as hats. We don’t travel with many large items so for me, this is usually any extra pairs of shoes. This is a must! I roll all of the dirty clothing and pack it into the bottom of mine (or one suitcase if I’m with my family). I typically pack it right on top of shoes, and will fill the suitcase as needed. It should be noted that I do not roll my clothing when I pack to go on a trip, I hate the amount wrinkles it leaves and it can lead to overpacking. I save smaller items to add anywhere I can fit them and use them to fill empty space. I check this by closing the suitcase and pushing down in areas to find spots with extra room once it’s closed. Then I re-open it and add the items to fill space. I hope this helps you get a little extra room in your suitcase for your flight home. While every single method isn’t perfect for everyone, I’ve done this every time we return from a trip and always have ample room to spare. On our trip home from Iceland it cleared so much space that I had a near empty bag. Do you have any tips for how to make extra room in your suitcase? I’d love to hear! These are really great tips. I never realized what a difference rolling clothes made until a few years ago. Now it’s the only way I pack! Such great tips! I’m getting ready to leave for a trip next week and then I have 2 big trips planned for September so I’m definitely looking for any tips for squeezing more into my suitcase! i roll mine and have since summer camp – it’s an awesome tip!! ps love that white one piece! I have seen people roll their clothing but I haven’t tried it. I have a couple trips coming up in September, so I will have to try this out! I only roll mine for the trip home so I have room for little extras I want to bring home. 🙂 Best of luck with packing! This is such a much needed post for me. I especially need help when returning from a trip. Isn’t it funny how you can go on a short trip, buy virtually nothing and still have SO less room to pack upon checking out? Or is that just me? Love you blog and your beautiful photos! Great travelling tips too.